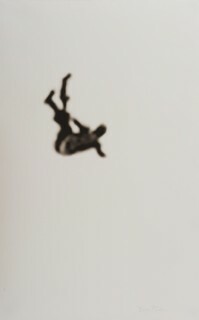 Falling Man Etched in Time. By Bryna Cohen. Bryna Cohen is an Ottawa artist best known for painting cheery bouquets of flowers. So, what’s with the startling representations of people jumping out of New York’s World Trade Centre just before the twin towers collapsed Sept. 11, 2001? Cohen is sitting in her westend studio hauling out the paintings and photo-based art destined for a 9/11-related exhibition Sept. 8-21 at St. Laurent + Hill Gallery in the Byward Market. She began crafting this body of work in 2005, hoping to arrange an exhibition one day. It’s taken awhile but, finally, she got a firm date from St. Laurent + Hill, her dealer, for the show and was delighted the timing coincided with the 10th anniversary of the terrorist attacks on the United States. Since 2001, Cohen has been haunted by “the desperation” of people in the World Trade Centre who had to decide in an instant whether to burn to death inside the towers or to jump to a sure death from the buildings. Although Cohen’s art is meant to pay tribute to these victims of 9/11, to help the world remember that tragic loss of lives, there will undoubtedly be people who feel this art is exploitative. Cohen admits that one of her own aunts, an artist in New York, is not pleased with this art project. The exhibition will include images harvested from actual photos of people plummeting to earth. These people tend to be mere specks in photographs published at the time in newspapers and magazines. 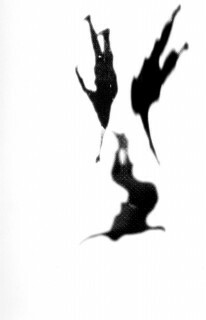 But Cohen has isolated the minute images of the people and enlarged them many times so that we see a dark humanoid form, arms and legs at odd angles, floating against a pure white background. Some of the final images show just one person and others show multiple people arranged like angelic skydivers. None of the images are detailed enough that the people involved can be identified by name. Along with the photo-art, Cohen has created expressionist paintings of people trapped inside buildings and others showing survivors running from the burning towers. The exhibition will also have paintings of flower arrangements, like those left by Ottawa residents at the door of the American embassy right after the terrorist attacks. And then there is the 9/11 wallpaper-like artwork. This roll of paper, 29 feet long, contains hundreds of small images of one of the falling men. Through the seemingly endless repetition of this one image, the falling man in this roll of paper comes to represent all the people killed Sept. 11, 2001. For some folks, Cohen’s images will be unwelcome, simply too horrific. But this is art not created just for today, but for the ages. Pablo Picasso’s painting Guernica, about the bloody Spanish Civil War in the 1930s, is far more horrific but it is also a stark reminder of the evils of warfare and is a painting treasured throughout the Western world. Likewise, some of the gory drawings by Francisco de Goya about the torture and death of Spaniards at the hands of Napoleon’s troops serve as a reminder about the depths to which mankind can sink. Vernissage: Sept. 8, 5 p.m. to 8 p.m.